Fall represents a lot of different things for different people, and everyone has their own reasons for appreciating this particular time of year. For those in rural and country environments, fall is synonymous with harvest. It’s the time when a lot of popular fruits and veggies come into season and are ready to be picked, eaten, and enjoyed. Apples are one of the best examples. Apple picking season usually begins in late summer and runs all the way through the fall into early winter. That’s why one of the most popular fall activities in America is apple picking, with many different orchards and farms welcoming in large crowds of hungry visitors each year. Ohio is a great state in which to do some apple picking. A lot of different locations can be found around the state, with some being in the Columbus area and others being located up in the northern part of Ohio, so you’re never too far away from a fruit farm or orchard. Ohio’s apple picking locations vary in size and scope, with some offering just a few varieties of apples, while others will grow dozens of different kinds. Some will also include a long list of extra activities for all the family to enjoy like cider tasting, live music, hayrides, tractor rides, barnyard animals, and more. If you’re looking to do some apple picking in Ohio, you have a whole host of locations to choose from. The state is blessed with a lot of good soil and great weather conditions, perfect for the growing of apples, so there are always big harvests in Ohio and hundreds of thousands of apples just waiting to be picked. Read on for some key details and overviews of the best apple picking locations in this state. Situated in Union County, CherryHawk Farm Apple Orchard is one of the highest rated apple picking locations in all of Ohio, having received near-perfect review scores from visitors online. This place offers an authentic apple picking experience with more than a dozen varieties to choose from. Different varieties come into season over time, and the surrounding landscapes offer a nice backdrop to your day in the country. Some of the apples you can pick at CherryHawk include Red Delicious, Fuji, Snow, Gala, Honeycrisp, Wine Crisp, and Mutsu, with the season starting in August and lasting through to the end of November. Located in the northern part of Ohio, this welcoming, family-friendly fruit farm has been managed by the Bauman family for several generations and features a whopping total of around 20,000 apple trees. Many peach trees and plum trees can also be found here, with pick-your-own opportunities for cherries, plums, and more. There are 21 different kinds of apples at Scenic Ridge Fruit Farm, so if you're looking to head home with a lot of unique varieties to be used in a myriad of recipes, this is a super spot to visit. 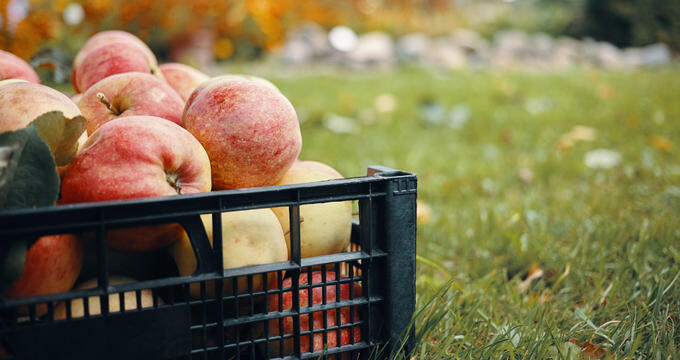 Located in Licking County, this Ohio apple picking fruit farm is one of the state's best-rated locations, having proven especially popular among families with young kids. Established back in 1919, Lynd Fruit Farm has been serving the Ohio area for almost an entire century now and offers more than 15 different apple varieties for U-Pick including Golden Delicious, Red Delicious, Pixie Crunch, Rome, McIntosh, Jonagold, Fuji, Melrose, Golden Supreme, and Crimson Crisp. Other varieties can be purchased pre-picked and new varieties are expected to be grown in the not-too-distant future too. As well as pick-your-own apples, this Ohio fruit farm also runs lots of special events and fun activities like an enormous corn maze for all the family to navigate. One of Ohio's little-known treasures, Hidden Hills Orchard is found in the southeastern part of the state in Washington County. Apple picking season starts in August here and runs through to November, with the eco-friendly orchard being open every weekend. 22 varieties of apples are grown here including Gold Rush, Gala, Honeycrisp, Cortland, Jonagold, and Jona Prince, and the farm puts a big focus on green energy and organic ideas, setting a great example for other Ohio orchards to follow. As well as apple picking, apple cider and other products can be purchased at Hidden Hills Orchard.